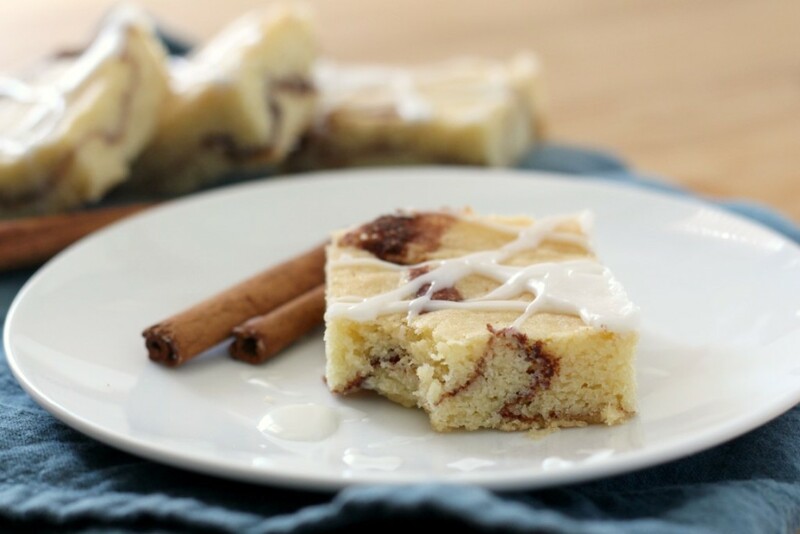 These Cinnamon Roll Blondies are thick and chewy with a sweet cinnamon sugar layer swirled throughout. So this is totally unrelated to food, but yesterday, in the midst of Monday morning laundry and catch-up, I went on a closet organization kick. I love this article on the 40 hanger closet and have toyed with doing a capsule wardrobe. Over the past 4.5 years since I’ve been married and living on my own, I have gradually been accumulating clothing and never purging. Plus after two babies, in addition to maternity clothes, I have clothing in several different sizes to fit my normal size as well as that awkward post baby size. Basically, my closet was packed full with stacks of clothes and I couldn’t find anything I wanted to wear. So I purged and got rid of half the clothes in my closet. Some things I had had since high school, didn’t fit right or weren’t in style. I hung up everything I loved and boxed up everything else. When I was finished I had about 30 hangers in my closet plus a few neat piles of sweaters, etc on my shelves, very close to 40 hangers. It is so freeing to see everything I love at once, it makes me feel like I have so many more options, rather than lots of things I hate.Most of my favorite pieces were blue with a few pink items, so maybe I’m getting close to that ideal capsule wardrobe. Some of the clothes I cleared out I will try to sell, some I will donate, and some I will send to thredUp. If you have never heard of thredUp, it is an online store for used, name-brand clothes, a pretty economical way to add nice, name brand pieces to your closet. (Check it out. If you use my referral link you’ll get a $10 credit. I’ll get $10 too!) They also will buy your nice, name-brand items that you are ready to part with. Have you ever done a major closet makeover? Give me all your tips, my closet is still a work in progress. Anyway, enough on the clothing rant. (Don’t worry, I’m not going to attempt fashion blogging). 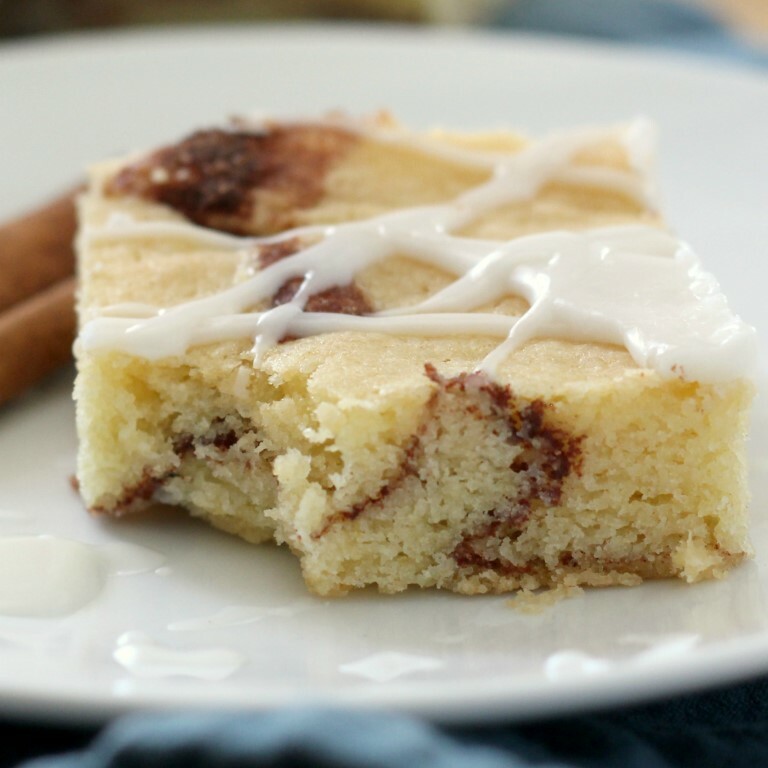 Just a quick word on these Cinnamon Roll Blondies, since this is probably the whole reason you’re here. If you need a quick dessert recipe to take to a potluck or party, these will be a hit, and they’re a little more unique than your average brownie or chocolate chip cookie bar. 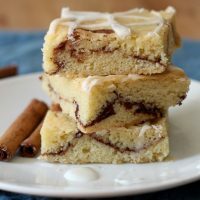 They stir up and bake quickly, look pretty with the vanilla glaze drizzle and are soft, chewy and full of cinnamon flavor. How’s that for a 30 second elevator pitch for these bars? Still working on perfecting it. Maybe this image will help. Preheat oven to 350 F. Whisk together the flour, baking powder, and salt in a medium bowl. Cream the butter and sugar until light and fluffy. Beat in the eggs and vanilla. Gradually add the dry ingredients to the wet and stir until combined. Spread the 2/3 of the batter in a greased 9 x 13 inch baking dish. 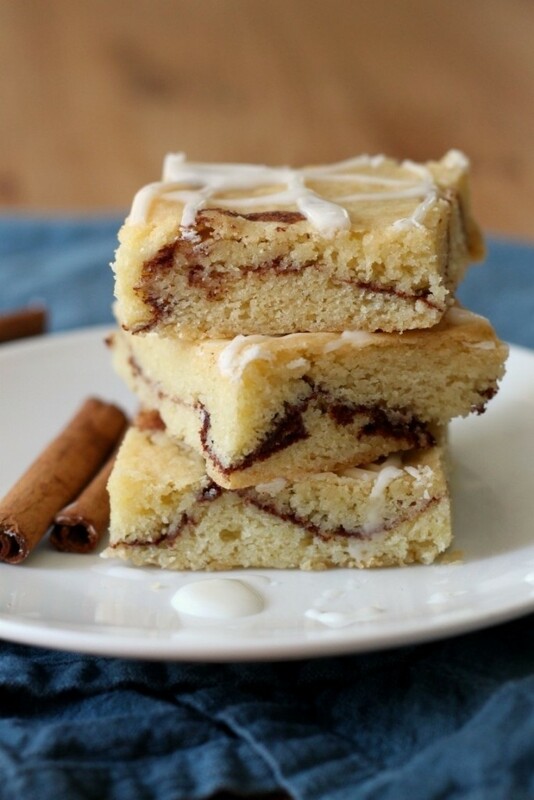 To make the cinnamon layer, stir together the sugar and cinnamon. Sprinkle the cinnamon mixture on top of the batter in the pan. Drop the remaining batter in teaspoon sized amounts over the cinnamon sugar mixture. Bake at 350 F for 20-24 minutes or until a toothpick inserted comes out clean. Let cool completely. To make the glaze, combine the powdered sugar, vanilla, and enough milk to make a smooth consistency. Drizzle over cooled bars. Store tightly covered on the counter for 2 days or freeze for longer storage. 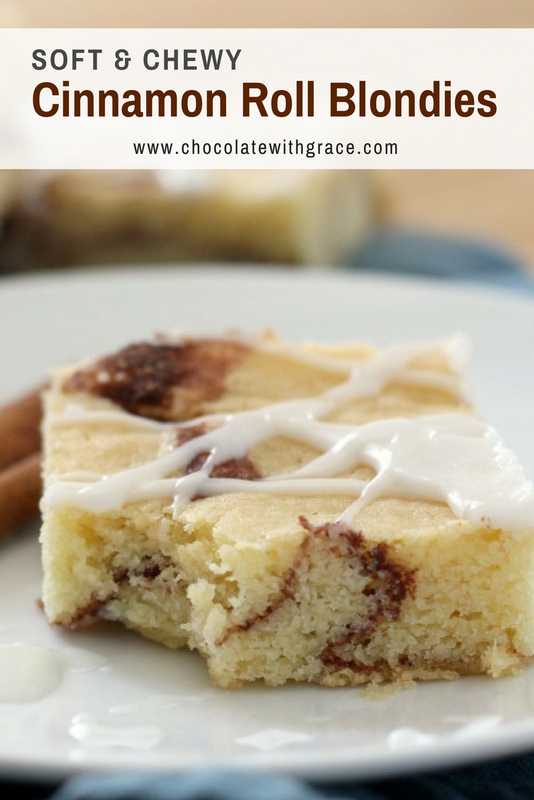 Adapted from this Snickerdoodle Bar recipe by Betty Crocker. 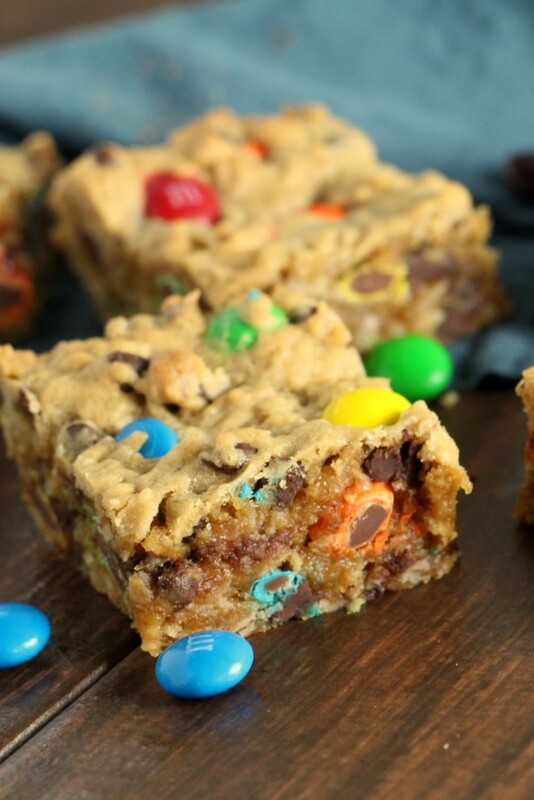 Also try my Monster Cookie Bars!